The SXM-11 Multimedia Speakers feature a built-in amplifier for additional sound volume. Amplified sound from the SXM-11 require either 4 "C" cell batteries or a 6 volt AC adapter both not included. 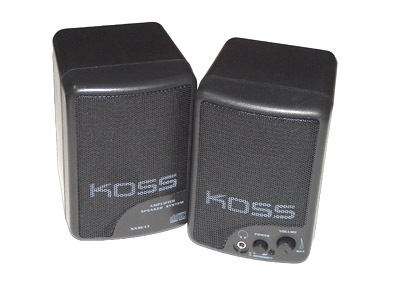 The Koss-Logitech SXM11 Multimedia Amplified Stereo Speakers deliver 4 watts of stereo output, and can operate passively or amplified. This model provides crystal clear sound, and the speakers are megnetically shielded for their protection. Dimensions (W x D x H) 3.5 in. x 3.5 in. x 5 in.